As a gateway for ski fanatics, Geneva is a cheap and easy destination served by some of the UK’s major budget airlines (Easyjet, Flybe, and Jet2 ). It is the perfect portal for a quick ski fix and most of my snow junky friends book flights in advance, watch the snow levels and head for the well-known resorts in France, Italy or Switzerland. With short transfer times of just over an hour, perfect for maximising slope time, I normally do the same. However, on my last trip I had the opportunity to discover some unknown little resorts within a fifteen-minute drive of GVA. Small and relatively unknown to English skiers is the little gem of Lélex – Crozet. As one of the largest downhill ski areas of the Monts Jura resorts, it is suitable for all levels of skiers. It makes a perfect day resort for seasoned skiers or a great weekend destination for families. The 30km of slopes can be reached easily via gondola from Crozet, on the French side of Geneva. With its summit at 1650m, this petite ski resort doesn’t suffer from blistering cold temperatures or windswept pistes. What it does offer are cheaper day passes, delightful tree-lined runs and quick, easy access to the slopes. Its potentially low elevation is alarming to some. But the resort boasts a high ratio snow cannons to service its 26 runs. It is this attention to detail which guarantees snow coverage in cold conditions and enables the resort to still thrive in lean snow years. Slightly farther afield from Geneva is the Col de Faucille and access to the ski resort of Mijoux. Nestling above the charming historic town of Gex and just thirty minutes from GVA, it boasts 12 downhill runs. It also offers some great cross country, tree-lined walking trails and stunning views of the Northern Alps. 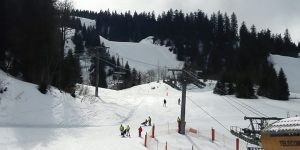 The third but smallest of the Mont Jura resorts is the Menthières ski area. A hefty 15 km from Bellegarde and fifty minutes from GVA it is not a solution for a quick easy ski. However, it is full of atmosphere and offers up to 10 downhill ski runs and some nordic skiing so is worthy of a mention. Unfortunately, snowfall in the area has been sketchy over the last couple of years. However, this season the snow depths have been incredible. So if you are short of holiday leave and low on funds but need an end of season quick fix, one of these small resorts could the answer to your dilemma.